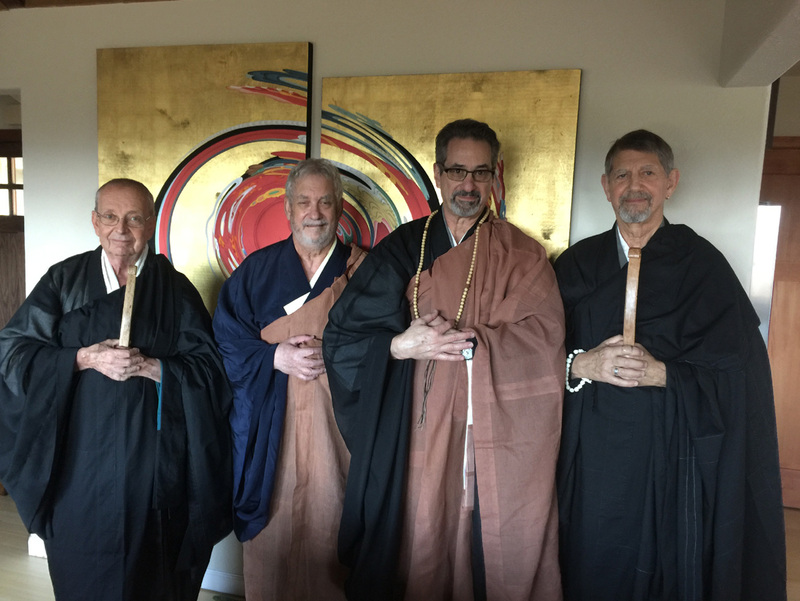 Here are more photos of Peter's Buddhist transmission ceremony, which took place on January 23rd of this year. 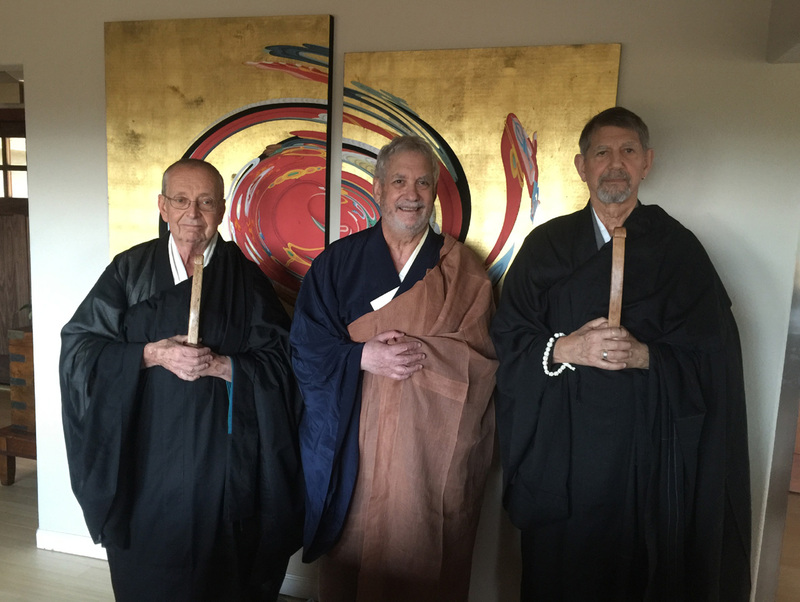 The first photo shows Al Tribe, teacher Lew Richmond, disciple Peter Shireson and Peter. 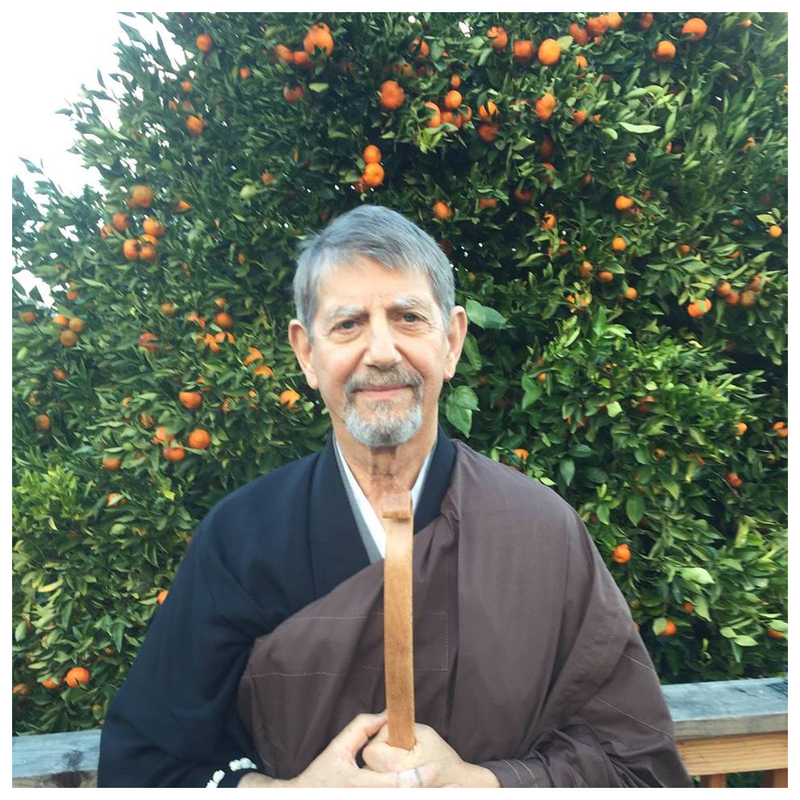 The second photo shows Peter with teacher Lew Richmond, Ed Satiszahn, the first of his former disciples and current abbot of SfZen Center, and Al Tribe, Peter's partner in receiving transmission. 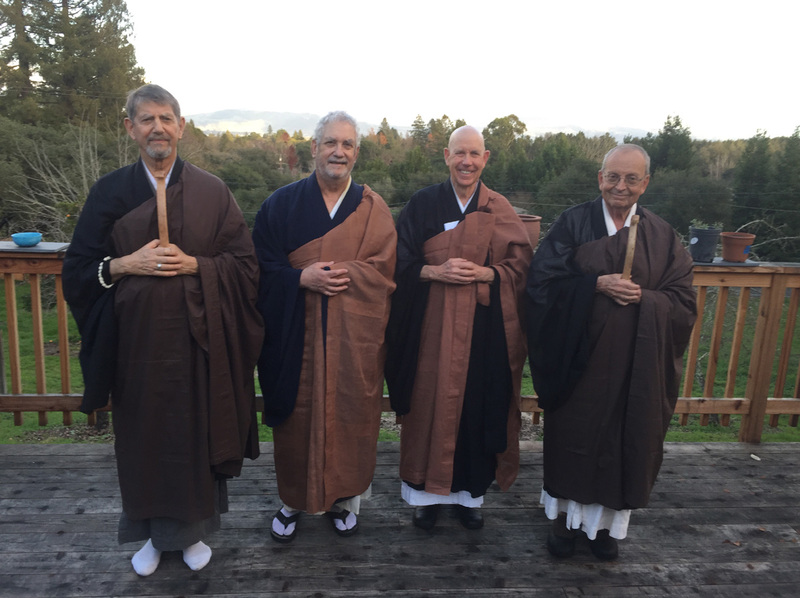 This transmission ceremony signifies the completion of Peter's work with Chikudo Lewis Richmond, his Zen teacher for the past dozen years, his understanding as a Buddha and his joining the ranks of "ancestors" of the Buddha. Hosho Jishi is his Buddhist name which means: Dharma Voice, Compassionate Warrior. This week Peter participated in a Bay Area event called the "Front Row". Metallica drummer Lars Ulrich was recently asked by a group of student curators at the University of California, Berkeley, to organize an event that touched on the creative process and explored what being from the Bay Area means to artists, business leaders and thinkers. A small number of tickets were sold to students for $5 each. The event that followed on campus Wednesday night was a diverse evening of panels. Besides Peter, it featured two members of Metallica, Primus' Les Claypool, and Ulrich's octogenarian father Torben. For several hours, the group discussed everything from art to philanthropy. I have added a new link on the Archives & Link page - "Here on the Edge" is the long-awaited story of how a small group of World War II conscientious objectors on the Oregon Coast plowed the ground for a generation of social and cultural revolution. Twenty years in the making and packed with original research and more than eighty photographs, this definitive history of the Fine Arts Group at Waldport is available from Oregon State University Press. It has been reported that work has begun this month on THE ETRUSCAN SMILE, a drama that Peter has joined alongside Brian Cox and Rosanna Arquette. Relative newcomers Oded Binnun and Mihal Brezis are directing from a script by Michael McGowan, Sarah Bellwood and Michal Lali Kagan.The story follows tough old Scotsman Rory MacNeil as he travels from his home in the remote island of Vallasay, Scotland to San Francisco. Seeking treatment for a terminal illness, the colorful character stays with his son and his family. Rory finds his precious days left alive transformed as he bonds with his American grandson. Based on the Spanish novel "La sonrisa etrusca" by José Luis Sampedro, the story’s setting has been shifted from Italy to the US. 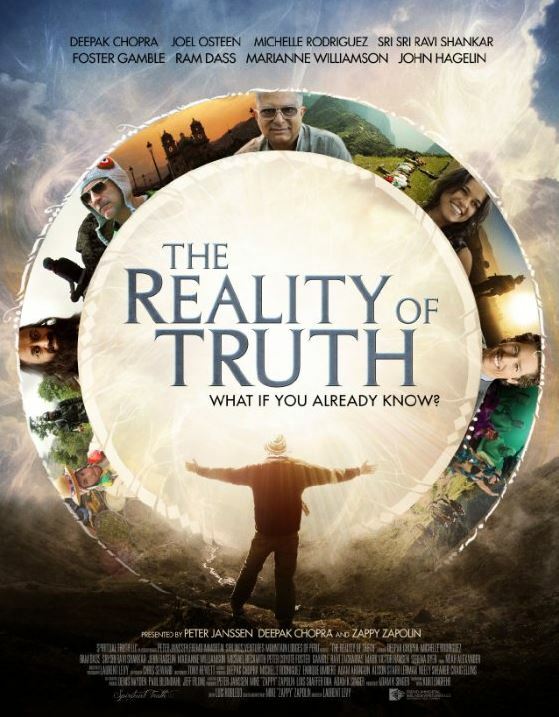 Peter was interviewed in a recently released documentary called "The Reality of Truth". This film explores the relationship between spirituality, religion and psychedelics. Hosted by "Zappy" Zapolin, the documentary features Deepak Chopra with interviews with spiritual gurus, celebrities and people of all faiths as they share their personal experiences with spirituality and transcendence. Among those interviewed are the late Dr. Wayne Dyer, meditation leader Dr. John Haglin, bestselling author Dr. Norman Rosenthal and renowned spiritual teacher Ram Dass. For screenings, visit the official web site. The California Arts Council celebrated its 40th anniversary with a sold-out special event at the Crest Theatre in Sacramento on January 27. Back in the ‘70s, Governor Jerry Brown appointed Pulitzer Prize-winning poet Gary Snyder of the San Juan Ridge as the first chairman of the new state arts commission. 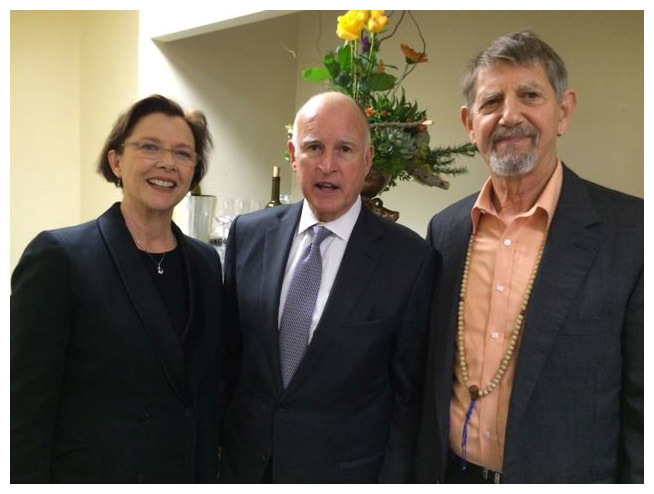 The celebration was hosted by Annette Bening with special guest, Governor Jerry Borwn, who created the Council in 1976 and Peter, a founding member and the second Chair of the California Arts Council. Want to listen to Coyote narrate a walking tour of Haight-Ashbury next time you visit San Francisco? It's possible using Detour, an app that offers tours of neighborhoods experienced through one's GPS-enabled smartphone. Detour is currently available in San Francisco and is expanding to New York, Los Angeles, and Chicago in 2016. 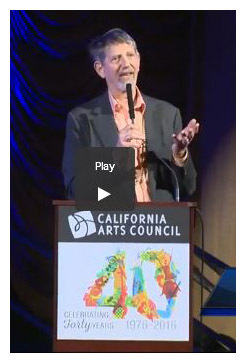 Here is an overview of the tour: Peter Coyote’s a famous actor now, but back then he was one of those starry eyed kids who flooded into San Francisco and got the sixties going. He’ll walk you through the heart of the Haight, where it all started - from the site of Jimi Hendrix’s first San Francisco concerts to the parade route where Coyote and his pals declared the whole scene dead and tried to bury it. Along the way, he’ll tell you about feeding whale meat to hundreds of people in a park, tearing it up with the Hell’s Angels, turning tie-dyed shirts into a fashion statement, and sparking radical social changes that have become mainstream. 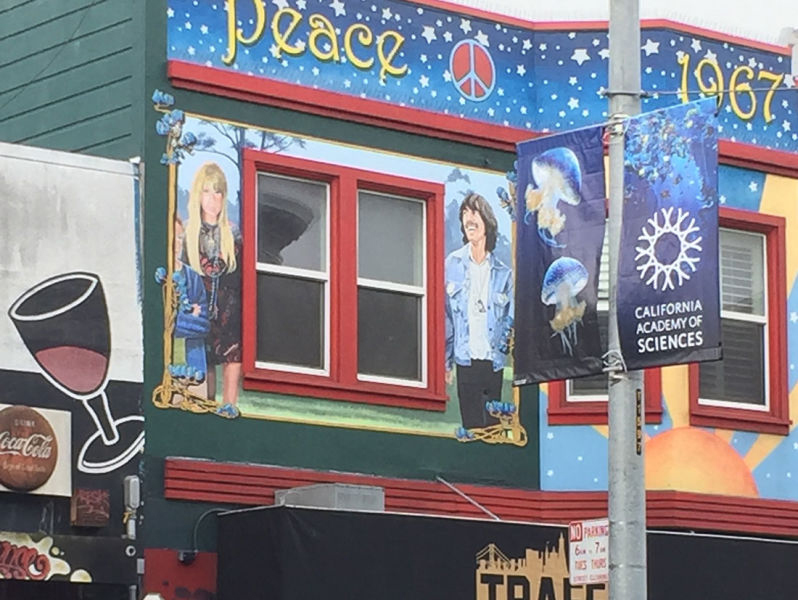 This tour shows you the real Haight Ashbury through the eyes of someone who was there. In the pop culture version of the 60s, the Summer of Love is always sunny and warm. But in reality, things got dark. Very dark. This walk shows you both sides. Here is a link to more information. According to the Press Democrat, earlier this month Peter brought some star power to the celebration of the recently opened Sonoma West Medical Center, vowing to do all he can to help the new venture succeed. After moving to the west county in October from his longtime home in Mill Valley, he soon became aware the former Palm Drive Hospital was reopening under new leadership and offered to help. "When you think about it, a hospital is actually a mechanism by which a community takes care of itself," Peter aid. "It’s not just like one good doctor. It’s not just like one rich patron. It’s a community effort." He admitted that unlike some of the wealthy benefactors who have helped the hospital get back on its feet, he doesn't have the financial wherewithal to bankroll the operation and fixing up an old farmhouse on a small orchard has just about tapped him out financially. However, he's helping get the word out that the hospital is open for business and oferring needed care. While he’s no expert in medical administration, Coyote said he’s spent enough time in medical facilities over the years to know a well-run health organization when he sees it. In the 1960s Peter lived in a commune in Olema, got hooked on heroin, and contracted Hepatitis C that wasn’t diagnosed until the late 1990s. "I was at the Marin County emergency room at 3 in the morning so often that I bought the doctors a cappuccino machine because they were so great," he said. 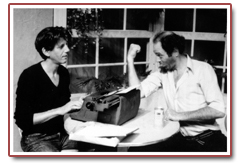 Flashback - 35 years ago: On July 10, 1980, San Francisco's Magic Theatre presented the world premiere of "True West". 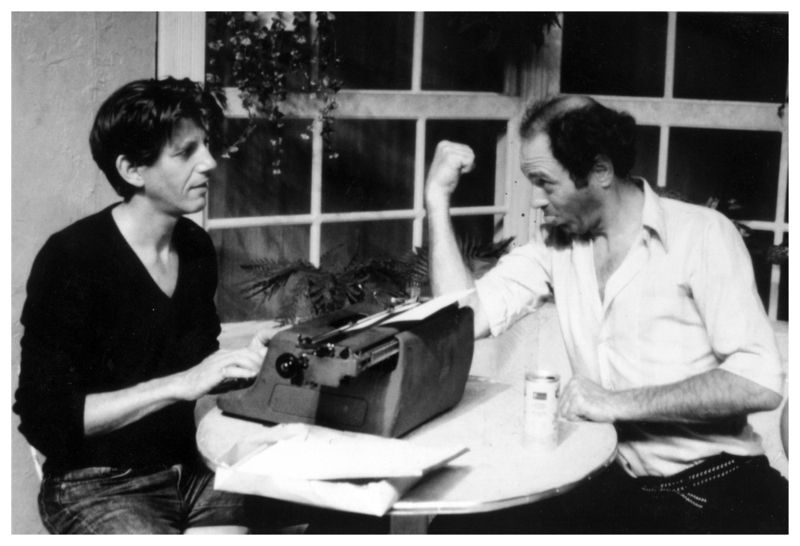 Sam Shepard was the resident playwright at the time when the first production was directed by Robert Woodruff and Peter starred as Austin with Jim Haynie as Lee. 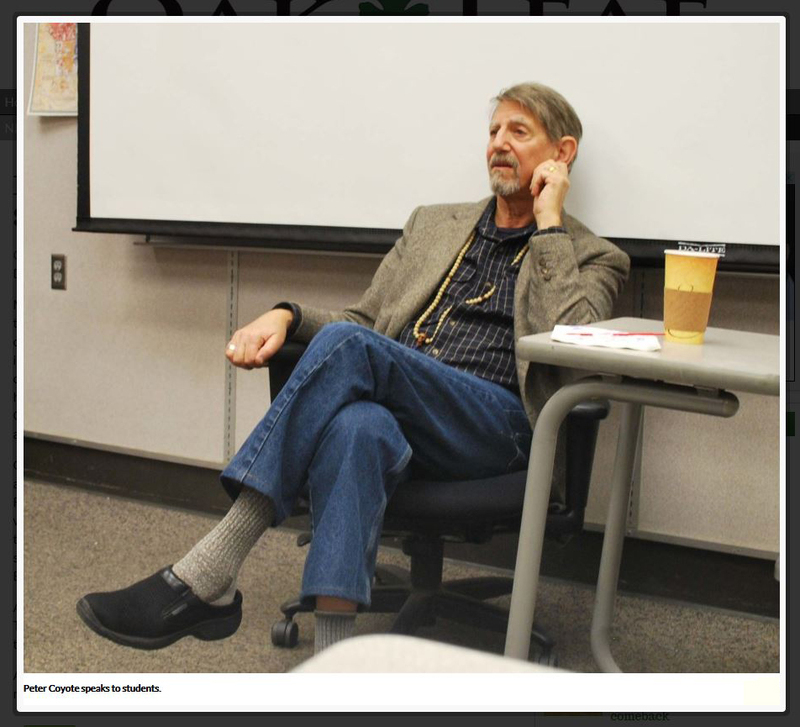 For her final, humanities teacher Jill Kelly-Moore of Santa Rosa Junior College gave her students a special treat with an invitation for Peter Coyote to speak to them. He shared his history as a Digger in San Francisco during the 1960s. He also spoke at length about making the world you want to be in a reality. An ordained priest, Peter told students the importance of finding inner peace. After his speech, he answered questions about a variety of topics, ranging from Donald Trump to authenticity. He said, "Everyone is authentic; it is those who have the courage to be authentic that are remembered." This year Peter has been narrating a new documentary series called BAY AREA REVELATIONS, featuring the untold stories of the people, places and moments which helped to shape San Francisco's Bay Area. NBC Bay Area (Channel 11) will air the final 2015 installment at 8:30 p.m. Sunday, after the NFL game. The 60-minute film called "The Artists" tells the stories of some of the groundbreaking and risk-taking residents who enriched the local arts scene. The compelling documentary project, a rare local production, has been such a hit that NBC Bay Area recently announced it will produce four more films next year. Joe Inderhees, the executive producer and co-writer speaks highly of Peter - "This is a guy who has read Ken Burns' stuff, so he definitely raises the bar for us. He's an absolute delight to work with - a Bay Area guy who loves to tell Bay Area stories." Gary Robinson's short film, "We Are All Related," won Best Animation the 2015 American Indian Film Festival held in San Francisco last month. Narrated by Peter, the film tells the story of a Choctaw boy who takes a walk in the woods near his Oklahoma home with his grandfather. Using a combination of science and tribal wisdom, the elder helps the boy understand his place in a great big universe. Robinson, who is of Choctaw and Cherokee heritage, has been creating content with Native American subject matter for more than 30 years, including documentary films, educational videos, children’s books, teen novels and non-fiction history books.